My Street Photography Quick Tips are short, easy to read and easy to use tips that I think could help you while shooting in the streets. Today’s post is about using photographic obstacles to your advantage. Have you ever found a parked car blocking that perfect view in a city you visit? Well, you can try to walk around, but sometimes that won’t help because the nice perspective disappears or there is another obstacle blocking your view. Well, as simple solution can be: Use it to your advantage. Include it in the composition. It just might made an otherwise boring composition all that more interesting. 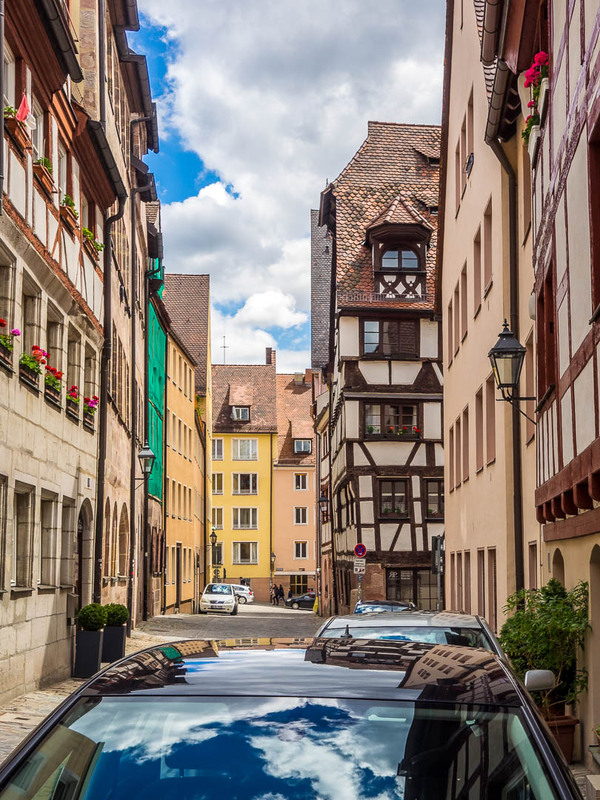 In this case I included the front window and the roof of a parked car als reflection surface while taking this shot in Nuremberg’s historic Old Town below the Imperial Castle. Try it yourself! Don’t be frustrated with this stupid obstacle, accept the challenge and have fun! Find all my other Street Photography Quick Tips in my new free Learning Center. That photo is amazing! That’s also really helpful advice, I have to try it out. I love this tip. I’m really into my street / urban photography at the moment and have been experimenting a lot in local area’s close to where I live. I never thought of using intrusive objects within the images to make the image that bit more interesting. Brilliant tip, I cannot wait to try it out myslef on my next street photography adventure! Thanks for sharing! I like the filter you used for your main shot…I think I have the same on my lightroom…Portra 400?? Thanks for commenting ! Actually, I used a self built pre-set for this shot, but I agree, it is similar to the Portra. Did and followed! Thanks, Alex! Nice post! I like the way you make your tips very short and easy to understand but helpful to most photographers. Great tip here. You’ve got my follow! Hey Marcus, I always chose to avoid street photography because every time someone or something would come in between and having an OCD for perfect clicks and being impatient has always made me avoid this type of photography. With your tips I think I will try to reconsider street photography and be more creative next time. that’s right, the car is a part of a street after all. You have me really noticing reflections in general so much more!! What a fantastic shot Marcus! I’m happy to have stumbled across this post (and to a greater extent, your blog). I’ve never considered such a tactic, but clearly it’s one that works well. This is a tip I’ll definitely bear in mind. Then we might have crossed ways, as I was shooting in the city 😉 Thanks for commenting! clever. I have always tried to work around it or crop it out in the post processing, which doesn’t always work… I will have to learn to embrace 😉 Thanks for the tip! Very common problem and a clever solution. Have tried it a few times. I use this technique regularly when shooting nature shots. Now that I’m venturing into the real world, I will keep in mind. Great suggestion. Excellent tip, Marcus! I am among those who walk around a car not knowing how to exclude it from the frame. Thanks a lot for this tip! And your photo is simply stunning! Excellent shot – you did well with this obstacle! And it looks like a clean car, too, since it reflects so well 😊 I hate it when they block the view and it can be hard to get creative! Thanks for the tip! Thanks for the great tip. I never thought about using the reflection in a car window as part of the composition for my shot.